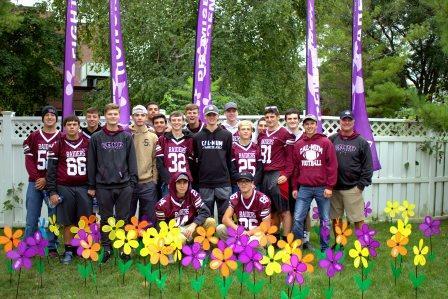 This is the second year the combined football team from Caledonia-Mumford and Byron-Bergen have gathered pledges and taken part in the Alzheimer’s walk in Batavia, New York. This year they were able to raise nearly $1,000 prior to the walk on 9/22 and have continued to use social media to raise funds. They worked with their football coach and a couple of parents to get a bus to take them to Batavia NY on a Saturday morning. This is the 3rd year of our being a merged football team and the two school communities have continued to grow closer as the kids from both schools have worked well together both on and off the field. I was not able to select Byron-Bergen High School in the drop down menu but they play football with us and took part in the walk.